Below are the most fun things to do in Mazatlan, Mexico, on vacation! Mazatlan is a travellers paradise! Filled with picture-postcard beaches, fabulous restaurants, bars and nightclubs, you can play, relax and shop up a storm. 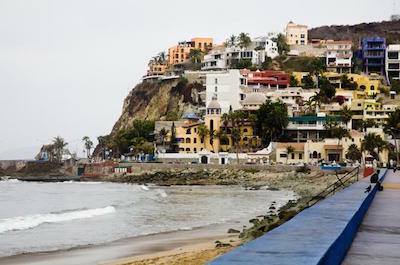 Visit quaint Mexican villages and sample famous Tequila. Learn about history and watch locals make handcrafted pottery and tiles. Have a blast riding an ATV or zooming along the waterfront on a Segway. For historians, there is beautiful architecture, monuments and Cathedrals. For sports lovers you can surf, dive and fish. Enjoy Mexican specialities and freshly prepared seafood at a thatched beach bar and then watch the most spectacular sunsets on the planet! Learning about the culture of the region is the first thing to do in Mazatlan. Join a tour with a knowledgeable local guide and be introduced to this amazing region, rich with history. Start off by exploring the Old Town and then travel to the countryside where you will see the quaint and colorful villages of Villa Union, Malpica and the colonial town of Concordia. The trip takes you up into the spectacular Sierra Madre Mountains. Watch the locals carve wooden furniture by hand, make pottery, roof tiles and pastries. Then head off for something stronger! The making of Tequila is a tradition that stems back hundreds of years. Visit the distillery at La Vanata, see the old equipment, learn about the art of making Tequila and, of course, make sure you sample some of this world famous drink. Then relax in the charming towns of Copalia and Concordia on a scenic trip. Explore 16th century stone temples and admire colonial architecture. Try your hand at bread making and buy a beautiful tile to take home as a memento. Looking for a paradise get-away where you can lie on a beautiful beach, soak up the sun, swim, walk and collect seashells? Then a visit to Stone Island, or Isla de Piedra, is the next thing to do in Mazatlan. You can get to the Island on your own by taking a Pulmonia taxi to the cruise ship port and then taking the public launch to the Island which runs every 15 to 30 minutes. 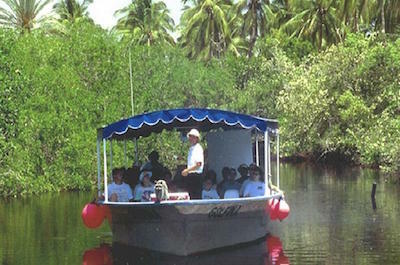 Another way is to join a guided tour that goes to the Island and includes other activities like visiting mangrove swamps and bird watching. This stunning uncrowded beach is popular with the locals and tourists. Enjoy a classic grilled seafood meal at a traditional thatched-roof restaurant where you can chat to the owner as he prepares your food. If you enjoy horse riding, explore the Island on horseback and if you are fit, you can explore the many scenic walking trails. For pure peace and quiet, visit on one of the non-cruise week days, where you will have this slice of paradise all to yourself! 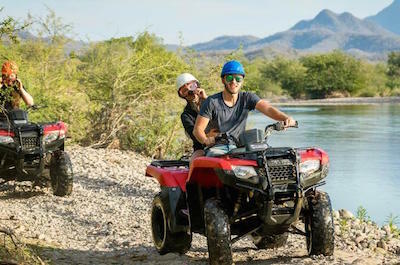 Riding along dirt trails and having a blast with friends and family in an open ATV is an adrenaline pumping thing to do in Mazatlan. 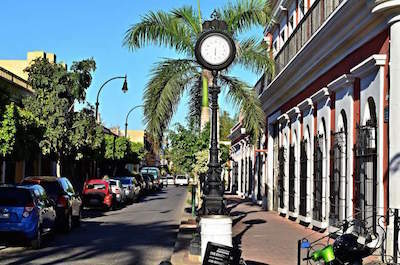 Join a tour where you will be taken to the colonial town of La Noria. Here, a guide will meet you, give you a safety briefing, safety gear and a driving lesson. When you are ready, follow your guide out of town into the dense lush jungle. Cross rippling streams, bounce along the dirt trails, look out for exotic wildlife and enjoy the spectacular scenery of the rainforest. Your guide will be with you all the way and will enhance your experience with local anecdotes and an insight into the history of the region. If you are with an adults only group, you can stop at the famous mezcal distillery and tour the factory at Vinata Los Osuna Distillery, ending your adventure sampling some mezcal shots. If you want even more of an adrenaline rush, combine your ATV experience with some zip lining, thrills donÕt get more exciting than this! Get up into the trees and fly over the jungle like a bird! This is the next not-to-be-missed thing to do Mazatlan. If you have never ridden on a zipline, now is the time to do it. Strung high up above the tree canopies of the Sierra Madre foothills are a series of 12 ziplines made from strong steel cables. Join your guide and have a quick orientation lesson and safety briefing. Then get geared up, attached and off you go! Sail from one platform to another, go as fast as you want or hit the breaks, it is up to you. If you are brave, rappel down steep declines under the watchful eye of your guide. End your sky sail with a panoramic zipline that takes you soaring over the blue agave fields. Catch your breathe and relax at the famous Los Osuna Blue Agave distillery where you can have a fruit snack, enjoy an educational tour and a tasting at this world renowned venue. 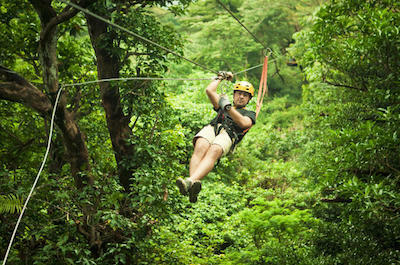 If you want more adventure, combine your zipline tour with an ATV drive through the jungle. 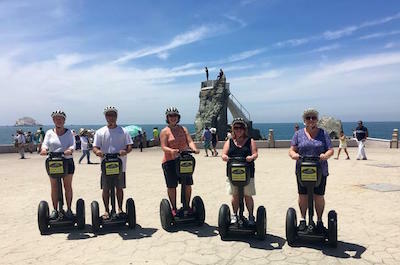 Exploring the Old Town is easy when you take a Segway and this is certainly the thing to do in Mazatlan. These fun two-wheeler bikes are ideal for all ages and all levels of fitness. Previous experience is not needed. Your guide will give you a lesson and a safety briefing and then you are off to enjoy the scenery as you glide effortlessly around the Old Town. This 2 hour tour takes you back centuries in history! Follow your guide along the Waterfront, ride around the ancient streets, stop at the stunning Cathedral and cruise past the Plazuela Machado. See Clavadista and Olas Altas. Your knowledgeable local guide will tell you all about the sites you are seeing and fill you in on the history, origins and culture of the Town as well as some humorous local anecdotes. Admire the beautiful architecture and stop and take pictures. End your ride by watching breathe-taking daredevil divers jumping off the cliffs at the Oceanside Park on the Malecon, into the waters far below. This fabulous tour is designed for a small group of only 6 people, making it extra special and personal. Spend time and get to explore the City on an enthralling, scenic walking tour. This is the best thing to do in Mazatlan! Follow your guide and immerse yourself in the ancient culture, traditions and history of this beautiful old city. Learn about Aztec settlers, Spanish conquests and American invasions. Walk up to WatcherÕs Hill and take in the stunning sights of the city and the Pacific Ocean. Stroll through the narrow streets of the downtown district, explore the famous Golden Zone, the 19th century Cathedral of Immaculate Conception and the Plaza de la Revolucion. Browse the colorful and packed stalls of the Municipal Market while you bargain for hand crafted souvenirs to take home. 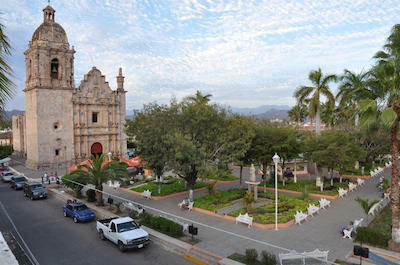 Explore the picture-postcard plaza of Machado Square and relax at a sidewalk cafe. Then gasp as you watch daredevil divers jumping off a 45 foot high platform into shallow water of only 5 feet. After 3.5 hours of rich cultural discovery, your guide will return you to your hotel. If you prefer, you can design your own exclusive day tour with a private guide and private van. Plan your itinerary and enjoy. 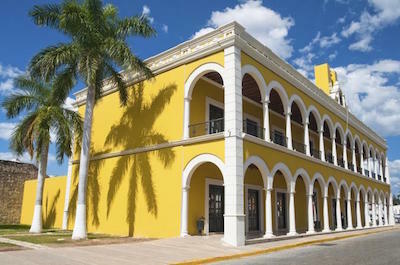 Visiting an old district that has been restored and turned into a trendy tourist spot is an exciting thing to do in Mazatlan. The Centro Historico has seen periods of decline and restoration and is today a vibey and upmarket area rich in nightclubs, restaurants, bars, galleries and boutiques. The old buildings still retain their historic outer 1800 and 1900 shells when the area was a busy sea port trading in fish, shrimp, minerals and iron. Inside, the decor is modern and fashionable, making for a great day or evening outing. See the Plazuela Machado, a small, tree-filled square with a wrought-iron kiosk as a focal point. Visit the ornate, neoclassical Teatro Angela Peralta, which was established in the 1860s and was later renamed after a singer who died of yellow fever only days before she was due to perform. Sip an exotic drink at a street cafe, explore the art galleries, watch the locals and then settle down for a traditional dinner and soak up the atmosphere. 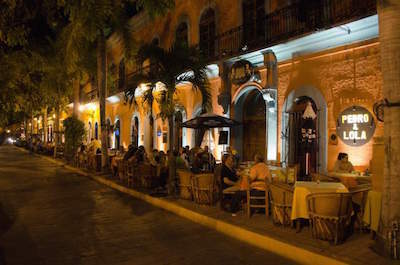 Soaking up the atmosphere in the Plazuela Machado is a relaxing and charming thing to do in Mazatlan. Head for the Historic District and find this lovely leafy plaza. Locals and tourists alike gather here to chat, eat, drink and enjoy the ambiance of an ancient city. The Plaza is a rectangular shape, lined with tall palm trees and old buildings painted in bright, vibrant colours. There are many museums to explore, shops to browse in and restaurants and pubs for a meal and a drink. The Plaza was built in 1837 by the wealthy businessman Plazuela Machado and has an iconic wrought iron gazebo in the middle where you need to take a selfie. If you want to walk around, visit the nearby Angela Perlata Theater, the Basilica and the Central Market. At night, the vibe is noisy and pumping with live music, performers and shows. Join in the fun with a group of friends, sit at a street cafe, order a traditional dinner with exotic drinks and become part of this iconic City. When you are considering things to do in Mazatlan, don't miss out on a visit to Zona Dorado, the Golden Zone! This is the hip and happening tourist area, packed with hotels, bars and restaurants and alive with fun all day and night. Until recently it was just a stretch of sand, but development has rocketed this region into the big time. Water sports lovers will find every type of sport they want from diving to snorkeling, jet skiing, swimming, kayaking and canoeing. Sailing trips depart from here to nearby islands where you can spend a day before returning for dinner. The Playa Los Sabalos is located in the center of the zone and offers the best swimming for all ages, with calm and warm waters. Playa las Gaviotas has rougher waters and can be more crowded. Enjoy the experience of sipping a cocktail as you dip your toes in the water. Eat freshly prepared sea food and then dance the night away. If you are staying at one of the exclusive hotels in the Zone, you can simply fall into bed for the day when the sun rises. Surrounded by stunning azure blue waters, taking a cruise is definitely one of the things to do in Mazatlan. Explore the Bay of Mazatlan on a scenic journey through P‡jaros, Venados and the Lobos Islands on a 5 hour trip with a professional crew of marine scientists. Get up close and personal with dolphins, sea turtles and sea lions. See exotic coastal birds and stunning scenery. Your guides will take you where you want and fill you in on all you need to know about the area. The luxury catamaran is fully equipped and super comfortable. Try some snorkeling on the magnificent reefs, stop for a swim on a deserted beach with crystal clear waters. Then come back onboard and enjoy a light lunch with bottled water and soft drinks. If you want to get active, have a kayak lesson while your friends relax on the deck and watch! 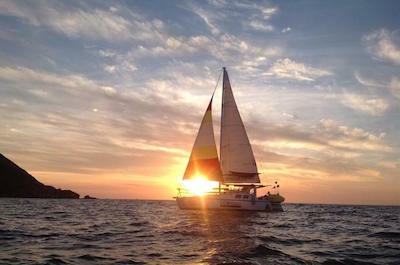 For the ultimate romantic adventure, a sunset cruise is the perfect thing to do in Mazatlan. Set sail on a Kolonahe trimaran, enjoy breath-taking sunsets with astounding colors, sip champagne and listen to your favourite music as you cruise the waters of the bay on an exclusive private tour. A day trip to El Quelite is one of the thrilling things to do in Mazatlan. Your guide will collect you at your hotel and you can relax on the 25 mile drive through rural Mexico. On your way you will stop at a quail farm and a cheese factory and a venue that makes beautiful ornamental fish tanks. Learn from your knowledgeable local guide about the history of El Quelite and the Mexican Revolution. Be mesmerized by tales of rebels, stagecoach robberies and daring get-aways to the coast. On arrival, enjoy the rural and peaceful ambiance as you stroll around the town. See the ancient streets lined with adobe houses with red roof tiles, admire the landscaped gardens, fountains and flowing bougainvillea. Visit the church of Our Lady of Guadalupe and stop at a rustic bakery to buy a treat. Stop to chat to the locals, you will find them relaxing at a street cafe, enjoying a game of Ulama. Then, do not miss out on the most fabulous experience - enjoy lunch at the El Meson de los Laureanos, the most famous Mexican restaurant in the state of Sinaloa. 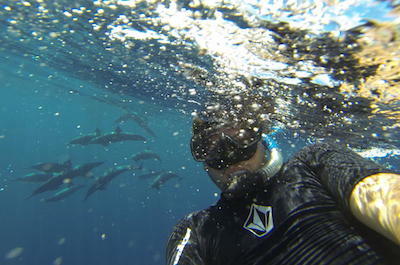 Do you have a lifelong unfulfilled dream of swimming with the dolphins? Then this will be an unforgettable thing to do in Mazatlan! Your guide and crew will collect you at your hotel. Listen to a briefing on security, details of the trip and the dolphin ecology project. Your trip will last for 5 hours and you will soon join dolphins in their natural and wild habitat. Sail off and enjoy the privacy of a small group and a private guide. On board you will have fruit, beverages and a fabulous lunch of Mexican torta - brisket, ham, cheese and vegetables. Searching for the dolphins can take up to an hour using weather conditions, data and hydrohones that locate them. Learn about dolphin whistles, research techniques and their life cycles. Once they are located and you draw up close, get ready and dive into the water! These are wild dolphins, some will be curious and come up close, others may ignore you. Watch them swim gracefully a few feet from you or closer. Make sure you get some photos. See them jump and dive, turn and glide during this life-changing experience. 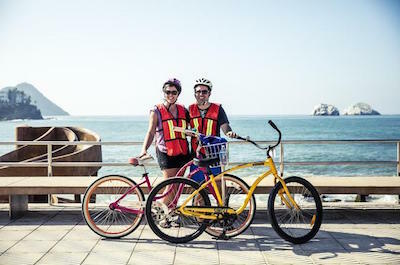 After walking, riding a Segway and having fun on an ATV, the next thing to do in Mazatlan is take a bike tour. This tour allows you to discover the natural and urban attractions of the harbor. Meet your personal guide at the Baikas Station at Hotel Pelayo. Set off at a leisurely pace along the sea front, where you can enjoy the fresh air and stunning views of pristine beaches and azure crystal clear waters. See the monuments and then head to the Historic Center with its winding alleys, awe-inspiring architecture and quaint shops. After stopping at the Cathedral, you will freshen up with a delicious cool ice cream. 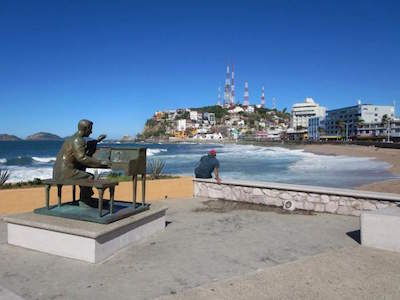 Then head to Plazuela Machado, a bohemian plaza in the center of Mazatlan, home to the Angela Peralta Theater. Visit other historical spots and the Clavadista to learn more about the history of the City. Then stop and watch daredevil divers dive from massive 45 foot high platforms into water that is a mere 5 feet deep. Cool your nerves with an ice cold coconut drink! If you prefer to go it alone, you can collect a map and follow a self guided bike tour to the famous spots at your own pace. Do it at sunset for an unforgettable experience. If you are a nature lover, a visit to the awe-inspiring Estero Ecological Reserve is an amazing thing to do in Mazatlan. The Reserve is home to over 270 species of birds and you are sure to spot egrets, sea herons, pelicans and more. The area is a combination of beaches, mangrove swamps, bubbling streams and lush greenery. A knowledgeable guide will teach you all you need to know about this unique landscape. Relax on a boat and enjoy the scenic ride as your guide takes you to strategic spots where birds meet and nest. You will learn about the local ecology, the seafood industry and myriad of wildlife that call this region home. Enjoy a delicious lunch on board of freshly prepared seafood and then set off to a deserted beach, only used by your group. Here you can swim, walk, snorkel, soak up the sun and enjoy this magnificent experience before setting off back to your hotel. For the perfect family bonding experience, a visit to the Aquarium is our suggested thing to do in Maztalan. There are attractions to delight young and old. 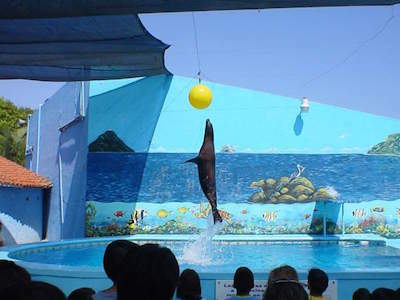 If you are up to it, dive into one of huge tanks to get close and personal with dolphins, sea lions and sharks. Take a stroll through the relaxing aviary and see beautiful birds like parrots and cockatoos. The kids can enjoy interactive games that test their knowledge of the environment and its creatures. Fun puzzles, memory games and quizzes will keep them enthralled. See massive skeletons of ancient marine mammals, explore stunning coral exhibitions and learn about the research and environmental projects that are undertaken. There are 34 saltwater fish tanks with exotic species like surgeon fish, octopuses, clownfish, seahorses and sea turtles. Be amazed at man-eating piranhas and air breathing lungfish! Stroll through the Botanical garden and visit the Crocodile Lagoon and then relax over a cup of coffee. 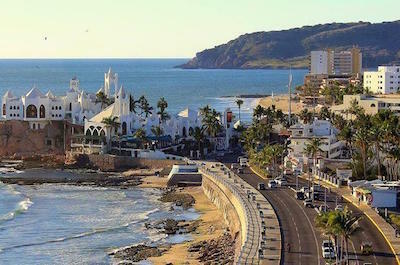 Strolling along the Waterfront street and soaking up vibe is a fabulous thing to do in Mazatlan. 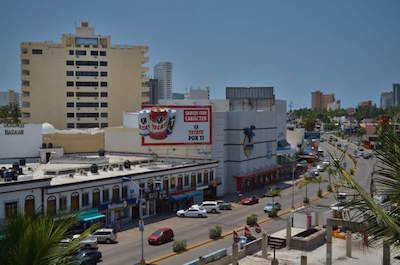 The Malecon is the main street, stretching from the Golden Zone to the Old Historic Town. It is where the movers and shakers meet, where the tourists and local come to relax, chat, eat, enjoy entertainment and the good life. The street is filled with beachfront restaurants, discos, nightclubs, bars and hotels. Prices are slightly lower than in the Zone and the atmosphere is more laid back. Take a slow walk and enjoy the scenery. Stop for a fabulous freshly prepared seafood lunch sitting on a pristine beach while small crystal clear waves lap the shore. Historians will enjoy exploring the many monuments and stunning architecture. The length of the road is about 3 to 4 miles and a slow walk makes for a great day outing with stops for treats and a rest along the way. When evening approaches, sit on the sea wall and watch the most spectacular sunset over the Pacific Ocean. If you are thinking of popping the ultimate romantic question Ð this is the place to do it! 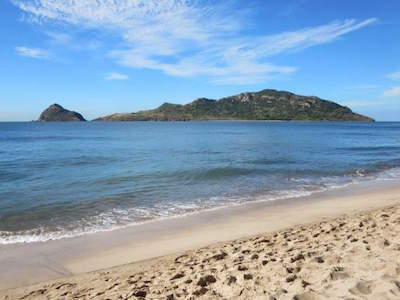 Looking for an idyllic beach is the next thing to do in Mazatlan! It is easy to find - Playa Brujas is located in the Cerritos district, a 10 minute drive north of Zona Dorada. You can drive or go by taxi or bus. This glorious beach makes a perfect day outing to relax, soak up the sun and work on your tan. A picture-postcard setting offers endless golden soft sand, beautiful rock formations, swaying coconut trees and crystal clear blue waters. The beach is named after a legendary witch who was said to have drowned swimmers, Bruja is the Spanish word for witch! The waves are also large and perfect for surfing or body boarding. You can rent equipment and take a lesson if you are a beginner. The surfing waves are best from November through to April. Then take a walk to the rocky formation at the far end, it is said to resemble the witch! 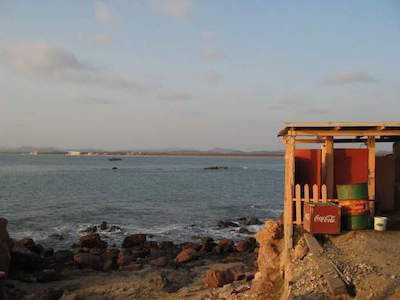 Enjoy freshly prepared seafood at a beach tavern and wait for the spectacular sunset. You will never run out of beaches to visit if you are searching for day-filled things to do in Mazatlan. Playa Cerritos is located about 20 minutes from the city centre and offers a picturesque setting of endless golden sand, clear blue waters and gently swaying palm trees. Enchanting rocky outcrops enhance the shore line and make the perfect setting to search for sea shells and other treasures. If you enjoy water sports, you can try your skills at surfing and body boarding. Then relax under an umbrella or soak up the sun, take a walk along the golden sand or have a swim. You can bring your own picnic or enjoy a scrumptious meal at one of the local thatched beach restaurants. The owner will personally cook up a storm and offer you freshly prepared seafood and traditional delicacies. As the sun sets, cuddle up with a loved one under a blanket and watch the most perfect fiery orange and red colours that light up the sky. 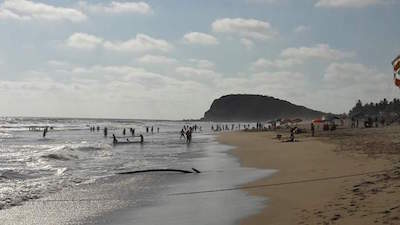 If you are looking for a picture-perfect surfing beach, the thing to do in Mazatlan is set off to Playa Olas Altas. This famous setting known as 'High Waves' attracts surfers from around the globe who come to ride the waves, relax on the golden sands and enjoy the Mexican vibe. This beach gets busy so come early if you want to claim your place on the sand and set up your beach towels. 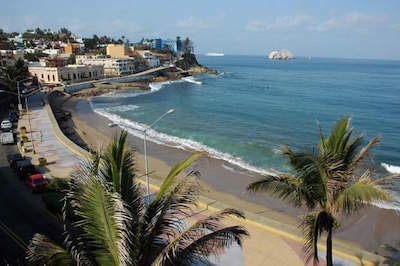 The beach lies alongside a large esplanade called the Malecon where you can take a stroll or a drive. It is filled with shops, boutiques, fabulous beach restaurants and bars. Enjoy a freshly prepared seafood dish and Mexican specialities like quesadillas and tacos as you sit and watch the people go by. Then take a stroll along the street, admire the architecture and see the statues of famous Mexican characters like Pedro Infante and Fernando Valadez. This beach does have strong currents, so swimming is not recommended. When evening falls, get out your camera! You will be treated to the most exotic sunsets on the planet. Nature lovers will find that a visit to Isla de los Venados is a fabulous thing to do in Mazatlan. This Ecological Reserve is situated in the middle of the famous Tres Islas of Mazatlan. It is a towering, rocky island that can be reached by boat, jet ski, sail boat or kayak. You can rent a boat or you can arrange to go with a tour operator. When you arrive, you will find a deserted, picture-perfect beach where you can set up your umbrella and towels and relax in the most beautiful natural setting. If you are not on a tour, bring your own picnic, there is no food here other than coconuts! These waters are perfect for snorkeling and diving and offer a rich variety of colorful marine life to be discovered. Inland, the island is filled with animals like squirrels, badgers, bats and deer. If you are fit, climb the mountain to get the most spectacular views of the ocean and Mazatlan. Can't get enough of the wet and wild? Setting off to Aqua Sports Center and Scuba Dive will soon have you enjoying thrilling water sports and is a not-to-be-missed thing to do in Mazatlan. This center offers excursions, fishing trips and water activities for all ages. Have a lesson in scuba diving in a pool - you don't need certification and you will experience the full fun of this sport. Enjoy a crazy ride on a jet ski with an instructor or on your own after a quick lesson. You can learn to surf the waves or try stand up paddle boarding. Kids will love boogie boards and learning how to swim with flippers. Then, for more fun things to do in Mazatlan, rent a kayak and explore the beautiful coast line, you can paddle alone or with a partner. When you are done, head for the beach and climb into the seat of a parasail. Fly high over the exquisite beaches and get a bird's eye view of this magnificent coastline.